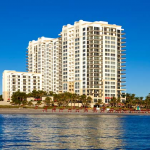 The Old Palm lifestyle now extends all the way to the beach through our new membership at the Palm Beach Marriott Singer Island Beach Resort & Spa. One of the biggest benefits is that members of Old Palm are welcome to use the resortâs private beach whenever they wish. Complimentary beach chairs and umbrella set-ups are included. Old Palm members will also have access to the resortâs superb amenities, including the swimming pools, restaurants and the indulgent Si Spa. Feel free to swim laps, sip a tropical drink in a freshly opened coconut, savor a Seared Yellowfin Tuna NiÃ§oise Salad in the oceanside restaurant, and enjoy a soothing warm-stone massage at the Si Spa. The offerings are so extraordinary and the service so impeccable itâs like taking a part of Old Palm with you to the beach. Oh, yes. Donât forget about the beach at the Singer Island Marriott. Itâs a private stretch of sand and just waiting for Old Palmâs members to enjoy.